John Lennon’s Poster Replicated – Mr Kite! 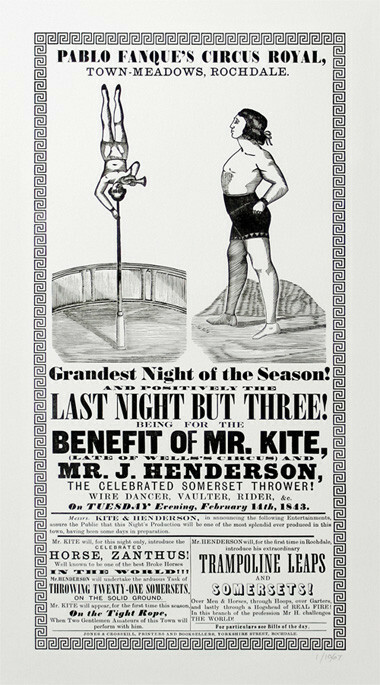 The Beatles tune “Being for the Benefit of Mr. Kite!” was inspired by an 1843 circus poster that John Lennon purchased at an antiques store and hung in his music room. This entry was posted in Beatles, Beatles Collecting, Beatles Music, John Lennon and tagged Beatles, Beatles Collecting, John Lennon, Music, Sgt. Pepper by beatlesblogger. Bookmark the permalink. Mr Kite – the truth! It’s quite expensive, but after watching the video, I can see why it would cost so much. So much effort has been made to make this poster,all while reviewing a photo of John with the poster, and figuring out how the poster would look like in actual size! Definitely would be awesome to own.